Garsington Opera for All returns this year with free public screenings of Garsington opera productions, targeting isolated coastal and rural communities. This year there are free screenings of Garsington's new production of Handel's Semele in Skegness (1 July), Ramsgate (22 July), Bridgwater (29 July) and Grimsby (11 October), and each event is supported by a large-scale programme of education and outreach work, firmly integrated with the free public screenings and providing opportunities for communities to be involved in creating, learning about, and performing opera. Semele will also have a free public screening as part of the Oxford Festival of the Arts (1 July) and Garsington Opera's 2016 production of Tchaikovsky’s Eugene Onegin will be screened this year at the Buckingham Film Place community cinema (17 June). Opera for All is a three-year partnership project between Garsington Opera, the charitable trust Magna Vitae, and the Coastal Communities Alliance, and is supported by Arts Council England’s Strategic Touring Fund. As a result of this partnership an online network – the Coastal Culture Network – has been formed. In 2016 Opera for All worked with 25 schools, reached 1,000 young people, working directly with artists in residencies, and provided skills development for 50 teachers. Over 2,500 people attended the opera screenings. 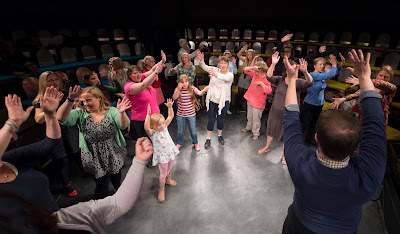 You can read more about Opera for All's work in my article and read all about my visit to Opera for All's Eugene Onegin event in Grimsby last year.